In the hallway of the 6th floor of Google’s new Chicago office, a grouping of concrete benches with simple, clean lines enhance the modern, industrial look of the space. The double-section benches, which are staggered in height, span a total of 25 feet. Steel beams hidden underneath help support the long spans. A free-standing 8-foot bench of the same design completes the grouping. For a company as innovative as Google, which has revolutionized the way we search the Internet, an office environment that’s equally state-of-the-art is a priority. Before the technology titan opened a new office in a former cold-storage building in the Fulton Market district of Chicago in 2015, they transformed the space using unconventional furnishings, such as these double-section concrete benches that span 25 feet. 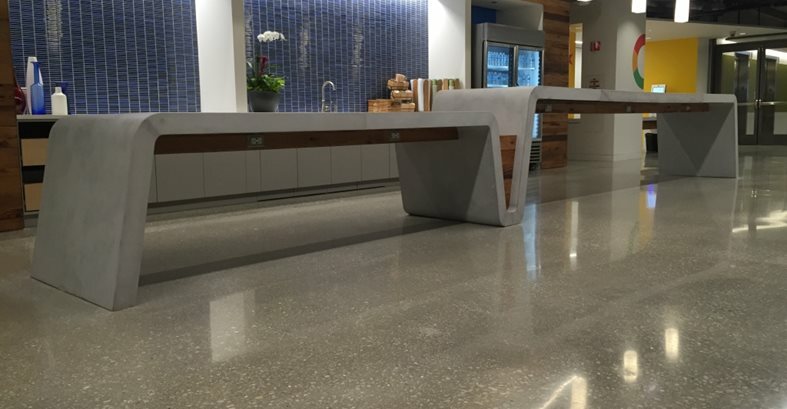 Kerr cast the benches using Surecrete’s Xtreme glass-fiber-reinforced concrete countertop mix. For extra rigidity, he reinforced the concrete with basalt rods and fiberglass scrim. “The rods are essentially hollow, to allow for electric wiring to be run inside the legs. There are also steel beams hidden underneath,” he says. In addition to the double-span unit, the project also included a shorter free-standing 8-foot bench. “The trickiest part of the mold making was getting the radiuses right. We built a frame for the mold, then lined it with flexible thin laminate, then sprayed and packed ¾ inch of concrete directly onto that,” says Kerr. See more examples of Kerrs custom concrete furniture. Kerr Concrete Designs, Evanston, Ill.